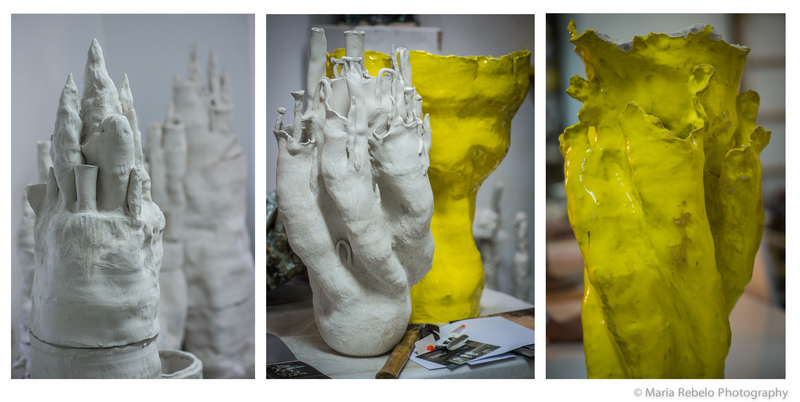 Beatriz Horta Correia, Ceramics, 2013. Graça Pereira Coutinho, Ceramics, 2013. We were invited to meet two artists in a studio on the outskirts of Lisbon. We drove through the city until we turned onto a gravel road surrounded by lush vegetation. An old gate with an inscription that read Quinta de Mil Fontes (Thousand fountains farmstead) opened and we saw an ancient house designed in a mixture of styles, like an architectural compendium built out of stone. Fountains and brooks whispered all around us as we walked to the art studio adjacent to the house. It is spacious, filled with light, decorated with a large Indian doorway and exotic furniture; the kind of place where Matisse would probably have felt at home. The two artists were there to greet us. Graça Pereira Coutinho speaks with a contagious enthusiasm. Beatriz Horta Correia has a quiet intensity. They told us that in 2010 the S. Bernardo ceramics factory in Alcobaça was about to close. The owner, Manuel da Bernarda, decided to let artists use the factory while it was still open. So Beatriz, Graça, and four other artists began to spend their weekends at the factory. They would work late into the night, mesmerized by the power of clay, water and fire. Drawing on the knowledge of Manuel da Bernarda, they began to do highly experimental work, pushing the limits of the ceramics technology. They mixed porcelain paste with paper, cloth, and other materials. They cooked the pieces at temperatures so high they almost melted. The results are poetic, ethereal works with edges so thin, so full of light they do not seem to belong in this world. These pieces found success and acclaim in the world market. As a result, the factory remains open, producing ceramic art instead of tableware. Graça and Beatriz accomplish a remarkable feat with their ceramic work: they meld the heaviness of matter with the lightness of spirit. Click here to see Graça Pereira Coutinho’s web site and here to see Beatriz Horta Correia’s website.